I will admit, I love school supplies! My favorite brand is Five Star✰✰✰✰✰. From the notebooks with the cool designs to the newest backpacks, Five Star products are trendy. Begin the school year with the latest products from Five Star with this back to school giveaway. 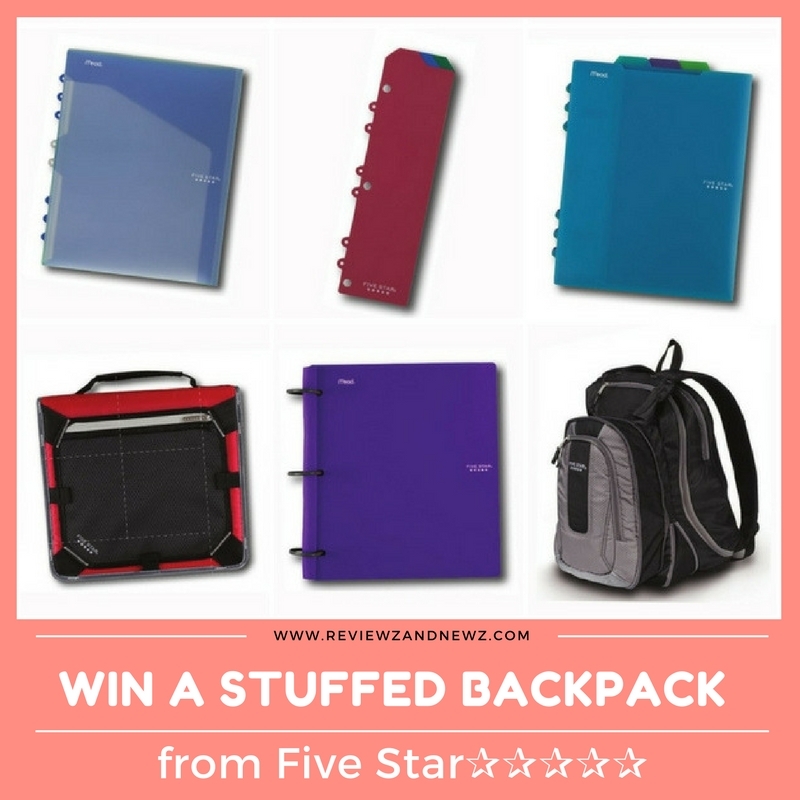 You can win a Five Star Backpack STUFFED with items from Five Star! Enter the Rafflecopter below. Winner has 48 hours to respond to email. Reviewz & Newz is not responsible for shipping to winner. Our friends at Five Star will take care of that. Many thanks to The Mommy Island and The Kids Did It for hosting this awesome giveaway hop! Enter all of the giveaways below! You can win more than one prize on this list! 3 things are clothes, shoes and a backpack. I would like the backpack the most for my son. I am purchasing supplies for a school counselor to give to under privileged kids. It's too long to list! Notebooks, pens, pencils and so on! I don't have a list. My children are grown up now. But one of them is going to be attending college next month and can use these. I'd say I'd most like the Kenmore 3.3 cu. ft. Compact Refrigerator. My kids have tissues, loose leaf paper and of course glue sticks on their lists. That's a great giveaway. My grandson starts kindergarten next year so I love getting supplies for him. My son needs glue sticks, colored pencils and loose leaf paper. I still have to get their shoes, backpacks, and pens and pencils!!! On my list is pens, pencils and notebooks. Shoes for the children, folders, and a backpack. Backpack, shoes, zippered pouches are on my back to school list. Three things on my list are binder, backpack and calculator. Three things on my list are tissues, backpacks, and shoes! Three things on the back to school list are notepads, sharpies and a bunch of folders. I have a backpack, shoes, and pencils on my list. We have notebooks, binders and pencils on our list. Well..my kids are grown and out of school, but I want to go back to school for Nursing! I need a new laptop, lots of notebooks and nice pens!!!! God bless and good luck everyone! Oh...my granddaughter is starting Kindergarten, so she could use this prize for sure! Three things on our back to school list is comparalized binder with zipper, mechanical pencils and notebooks. Pens, pencils, paper, erasers..big ticket items like calculator and computer..backpack..
We are in need of a new backpack, some pens and folders too! Three things I need for back to school is paper, pencils and pens. Pens, copy paper, and ink are things on my list. We have to have divided notebooks, good fine tip markers and decent scissors. Thank you for your super giveaway opportunity! Pencil's, Markers & plenty of kleenex! We need pencils, new printer ink, and erasable pens. We need new shoes, a back pack, and binders. Loose leaf paper, fun pencils, red pens for marking papers. Don't have kids, so I don't have a back to school list. If I were to win, I would give this to my friend who is a teacher. Although, when I was in school, on my back to school list was always folders, pens/pencils, and notebooks. I need a new backpack, Notepads and Folders to keep all my projects, assignments and homework organized!!! Notebooks, folders and pencils are a must have for my little girl. Backpacks, 3 Ring Binders, and Pencils are the 3 things on my back to school list. Crayons, pencils, paper, homeschool curriculum... these are all things that are on our back to school list each year. I'm almost finished getting everything together. We still need pencils, 3 ring binders, and a usb flash drive! New shoes, new coat and new clothes. Besides the long list the school requires, each kid is getting new backpack, lunch box and water bottle. Oh, and a bottle of wine and a book for me. ! I'm all done with school, as I FINALLY finished grad school a few years ago. Also, I don't have any children. However, I will be starting a bullet journal soon-- so I hope to do some shopping for supplies for that project. I'm really excited about it! Our list this year has 6 packs of index cards, a 2 inch binder and a scientific calculator. Back packs, Pens , folders are 3 things on my list. We need backpacks, pens, and binders! We always need backpacks, shoes and crayons! We need a backpack, gym clothes and new shoes plus supplies. My kids are all grown up now, but when I was in school I needed notebooks, pencils, and a binder. My son needs notebooks, pencils and a binder. My daughter needs pens, notebooks and folders. My son needs paper, folders and pens. We need to get my daughter a new backpack, TI-84CE calculator and notebooks. He's pnly in kinder so it was backpack, pants and shoes. We bought folders, notebooks and pens. My daughter needs new shoes, paper and pencils. Binders, Backpack, Pencils and pens, Folders and much more! Composition books, folders and markers. Clothes, Backpack, device charger for high schooler with an iPad for school. Three things on my back to school list are a new backpack, lined paper, and a trapper keeper. My high school kids need graphing calculators, binders, and mechanical pencils. Thanks. Three things on our list are headphones, clear page protectors, and graph paper. Three things on our list are paper, Pens, and mechanical pencils. We have a new backpack, binders and pens. Calculator, pens, pencils and a backpack. Backpack, pens and a lunch box. I would like Disney Frozen Kids Backpack with Lunch Bag. On my list is pens, pencils and folders. new shoes, bookbag, and pencils. Pens, back pack and folders. Sandals, Notebooks and binders are on my list. A new backpack, colored pencils and composition books. Our list includes a backpack, glue and lined paper. Pens, paper and pencils are on my list. Three things on my grandson's back to school list are: pencils, colored pencils, Kleenex. Glue, crayons and printing paper. For my stepson? Crayons, glue sticks, and safety scissors! We need a backpack, notebooks, pencils and crayons for my nephew. I need pencils, folders, and notebooks for my classroom. Thanks! We homeschool; and we go through mostly pencils, pens, and erasers. We need paper pencils and pens. Thank you for the entry. Must haves for school are glue, markers, and pencils. A backpack, 3 ring binders and paper are on the list along with a lot more! 3 things on our back to school list are crayons, pencils and folders! clothes, shoes and a backpack. We needed to buy a lunch bag, folders and markers. Binders, pencils and glue sticks! I don't have kids so I don't have anything on my back-to-school shopping list. Composition books, pencils, pens and crayons. My daughters list has a bookbag, scotch tape, and sharpies. Hand sanitizer, word search book for downtime, and a calendar/planner! Pencils, crayons, and paper are on my list. Three things in our list is a new backpack, notebooks and pens. lined paper, lots of pencils, and a folders. Binders, Pens, and Lined paper are on my back to school list, but there are many more. Thanks! A protractor, multi-colored construction paper, and scented markers. Plastic pocket folders with brads, 24 pencils, Crayola markers. We need pencils, a pencil case and a lunch bag. My back to school list includes a new laptop, an iphone and a set of headphones. Calculator, 5 subject notebooks and markers. Pens, loose leaf paper and post it notes. Three things are notebooks, pencils, and come large paper clips. Sharpies, Dry Erase Markes, and more pencils.